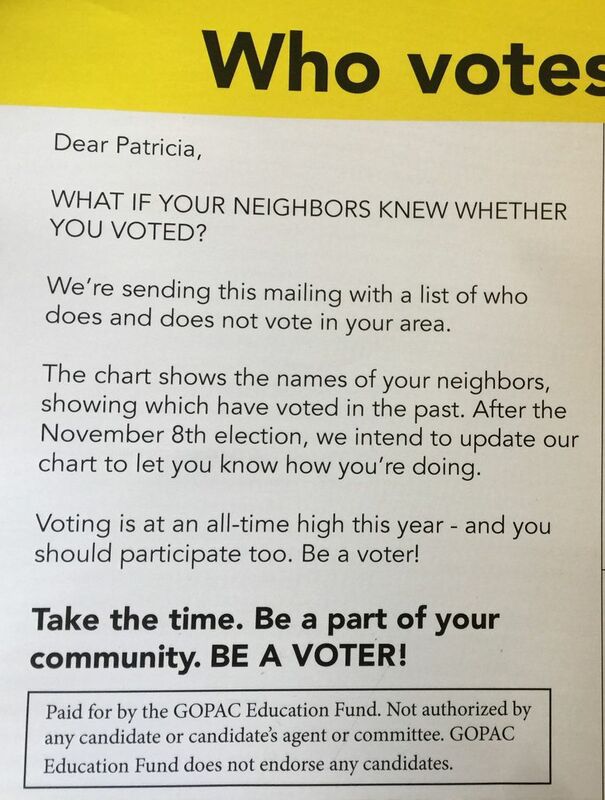 A national conservative group has sent mailers to some state voters disclosing their and their neighbors’ voting history, trying to pressure them to vote. Voting history is public information, but the mailers make some folks uncomfortable. It showed up in the mailbox on Tuesday. And then a chart, answering the first question and rendering the second one moot. The political mailer lists the names and addresses of the recipient and nine of his or her neighbors, along with whether each person voted in recent elections. Received by an unknown number of Washington voters, the mailer comes from the GOPAC Education Fund, a national conservative nonprofit. It builds on political-science research, indicating that social pressure — shaming, to put it bluntly — is among the most effective methods to get people to vote. GOPAC Education Fund is part of an affiliated network of GOPAC groups — some exclusively political, some partially — that share office space and staff in the Washington, D.C., suburbs. GOPAC, the political-action committee, recruits and financially supports Republican candidates around the country. It has raised and spent about $1.6 million this election cycle. Its biggest donor is GOPAC, the nonprofit, which has collected nearly $4 million this election cycle. The nonprofit’s stated goal is “to educate and elect a new generation of Republican leaders,” although its status as a nonprofit forbids it from “expressly advocating” for any candidate or party. The mailers, sent to voters in Bellevue among other places, do not advocate for any candidate or party. Wasem said the mailers were sent to voters in the 41st Legislative District, home of Washington’s most expensive state Senate race, one that could decide which party controls the chamber. She said she did not know, however, if they were sent to all voters in the district, or if they were sent to other districts in Washington. She also declined to say how many mailers were sent, how much was spent on the mailers or if GOPAC worked in concert with any group. On Tuesday, the state Republican Party posted a video to its Facebook page with a similar message. Some voters in Vancouver, the site of Washington’s second most expensive Senate race, also received the mailer, according to KGW-TV. A 2008 study found that such “social-pressure” strategies were far more effective at getting out the vote than more conventional methods. The study sent a series of mailers to several hundred thousand Michigan voters, all with different messages urging them to vote. “Substantially higher turnout was observed among those who received mailings promising to publicize their turnout to their household or their neighbors,” the study, published in the American Political Science Review, concluded. The language on the GOPAC mailer is copied, virtually verbatim, from the mailer sent in the 2008 study. Voter histories are available through the Secretary of State’s Office and county election officials. They are generally free of charge and can be used for political purposes but not for commercial purposes. In King County, campaigns often request daily updates of who has voted so they can target get-out-the-vote efforts, said Kendall LeVan Hodson, chief of staff for King County Elections. Voters’ names, addresses, jurisdiction, gender, date of birth, voter-registration number and voting record are public information, although phone numbers and email addresses are not. The Secretary of State’s Office said they have gotten a handful of complaints about the mailer. While the mailer is legal, Smith described it as potentially violating social norms.